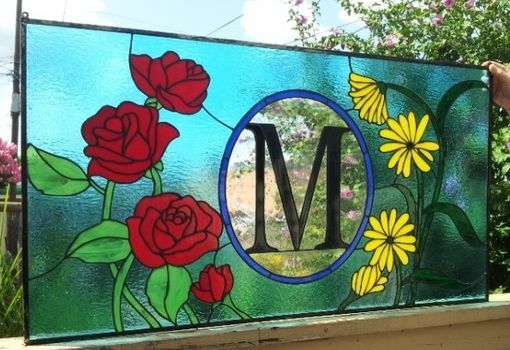 This original and beautiful piece will capture all the looks in our customer's home entry! 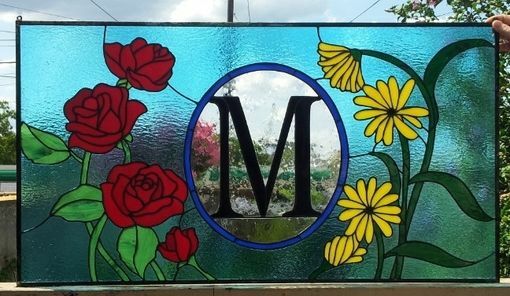 Glass: Transparent texture sky blue for the background, Opal Red roses with wispy medium green leaves and stems, Opal yellows Black Eyed Susans /sunflowers with dark green wispy opal stems. 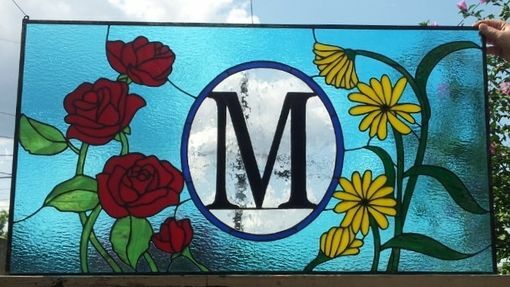 The Monogram is solid opal black with a clear seedy background glass and, finnaly, the border for the center is cobalt blue opal. Size for this one is 44 wide X 24 tall and can be made as a window or a hanging panel. If you love flowers or you have a favorite one, maybe you should consider incorporate them, as a stained glass piece, to your home decor!